The Uzbek-German Forum for Human Rights published “Silk Noose on Uzbek Farmers’ Neck,” which sheds light on 1) the use of forced labour in silk cocoon production in Uzbekistan and 2) centralised approach on the cocoon production and government monopoly, which impose production quotas on the farmers and forces the latter to sell the cocoons back to the state at lowered prices. In other words, the cocoon production is beset by same ills that befall cotton production: forced labour, the involvement of law-enforcement agencies and local governments, all the while state-dependent employees are forced into bribing their way out of compulsion. Fergana publishes an abridged version of the report, which was kindly provided by Umida Niyazova, the head of Uzbek-German Forum. Uzbekistan, a leading producer of silk cocoons, relies on forced labour for their production, which violates the rights of farmers and public-sector workers and exploits the vulnerability of the rural poor. Uzbek farmers and public organisations must produce silk cocoons under coercion to fulfil government quotas and they must sell their cocoons to the government at the official procurement price, leaving them little or no profit, and in many cases debt. The government of Uzbekistan processes and sells some silk cocoons domestically but exports the majority to global markets for hard currency. The central government establishes cocoon production policy, prices, and annual silk production targets, and requires regional- and district-level officials to ensure targets are met. Local officials use coercion, including threatening farmers that they will lose their land, to force farmers and public-sector institutions to fulfil annual silk quotas. Farmers, in turn, oblige family members, including children, or pay local labourers to assist in the cultivation of silkworm cocoons to meet required production quotas and avoid penalties. The system relies on and exploits rural poverty as many farmers can only meet their production targets with the help of local workers who agree to assist in the arduous job of cocoon production in return for desperately needed items such as firewood and food. Directors of public institutions require their staff to cultivate silkworm cocoons or make payments to contribute to the institution’s quota and avoid fines and other repercussions. Although the government promises to pay producers a government-set price for silk cocoons, in practice, the government usually only pays producers a small advance on the value expected from the producers’ quota of cocoons. We found that in many cases the government underpays or fails to pay producers upon delivery of cocoons. Silk production is expensive, labour intensive, and not commercially viable for farmers and other producers. All farmers we interviewed said that the government forces them to cultivate silk cocoons, in violation of national and international laws prohibiting forced labour, and that they cannot refuse the government’s orders. Uzbekistan is one of the world’s top three producers of silk cocoons, with the output for 2015 expected to exceed 26,000 tons. Silk cocoon cultivation has been a part of life for rural residents across Uzbekistan even before the beginning of the 20th century. The Soviet authorities developed the silk industry, built silkworm incubators, and distributed silkworm larvae to residents in every region of the country. In interviews with our monitors, numerous rural people told us that during the Soviet era, silk cocoon cultivation was a valuable means of contributing to household income. In many silk producing countries, cultivation of silk cocoons is seen as a key rural development enterprise or is part of poverty reduction strategies for the rural poor and especially women. 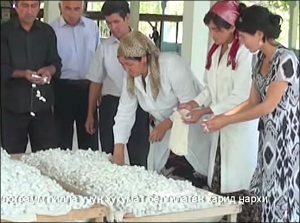 However in Uzbekistan, rather than using cocoon cultivation as a development strategy or means of poverty alleviation, the government exploits the most vulnerable sectors of the population, such as farmers, teachers, and rural residents dependent on social welfare payments, to force them to cultivate cocoons under threats of penalties. Although the total amount of silk produced in Uzbekistan makes up only roughly 5% of the total global volume (by contrast, China produces approximately 80% of the total volume), Uzbekistan produces more silk per capita than any other country. The Uzbek government considers silk a strategic export, and it serves as a key source of hard currency for the government. The government maintains total control over the silk sector, as it does with the cotton sector, establishing production targets, imposing quotas on producers, and setting the price at which it buys silk from producers. The government sets a low official procurement price for silk, maintains a monopsony over silk cocoon purchases, and sells the cocoons as well as other silk products such as silk thread, yarn, and fabric, abroad at international market rates, reaping a significant profit. Uzbekistan exports the bulk of its raw silk and dried silk cocoons to India, Iran, China, South Korea, the United Arab Emirates, Turkey, and Russia. Management of the silk sector is divided between the Ministry of Agriculture and Water Resources (hereinafter, the “Ministry of Agriculture”) and the state-owned joint stock company Uzbekyengilsanoat. The Ministry of Agriculture oversees the production of raw cocoons. It has territorial associations in each region called Pilla (“Cocoon”). The Pilla branches enter into contracts with farmers for cocoon production, distribute silkworms, and run collection centres where raw cocoons are accepted, weighed, and sorted. Agronomists from the Pilla branches also visit farmers periodically throughout the silk production season to inspect production facilities and check on the process. Uzbekyengilsanoat controls silk processing and export, including spinning, weaving, and exports of silk products. It owns, in whole or in part, all silk-spinning factories throughout the country. There are currently 36 major silk processing factories in Uzbekistan. Investors from Japan, South Korea, China, the United States, Switzerland and Great Britain have entered into joint ventures with Uzbekyengilsanoat and currently co-operate some of the silk processing factories. Uzbekyengilsanoat is the sole purchaser of silk cocoons and buys cocoons at the government-set procurement price. The silk production plan and the procurement price for silk is established annually by the Ministry of Agriculture and Water Resources in cooperation with Uzbekyengilsanoat and the State Committee on Privatization, De-monopolization, and Competition. Although the exact price varies according to the quality of cocoons, in 2015 the average official procurement price for 1 kilogram of cocoons was approximately 6,000 soums (approximately 1.5 USD). Although formally the Ministry of Agriculture oversees silk cocoon production, as in the cotton sector, in practice local government officials at the regional and district levels, known as hokims, bear enormous responsibility for the fulfilment of the cocoon production plan and use coercive measures to ensure that production targets are met. Hokims are responsible for imposing quotas on individual cocoon producers. Generally they allocate the regional production target among farmers, forcing farmers to meet quotas based on the size of their land holdings. However, it is common practice for hokims to impose cocoon production quotas on mahalla committees (local neighbourhood councils, a local government institution) and public organisations, such as rural schools, colleges, agricultural institutions, hospitals, and medical clinics, to meet the regional production target. Hokims wield significant control over their regions and have the authority to involve local law enforcement, tax officials, and various government inspectors to force local populations to cultivate silkworm cocoons under threat of penalty. The government of Uzbekistan appears committed to expanding silk production in the country, which has enormous implication for the use of forced labour. The government has pilot tested production of silk cocoons twice a year, instead of the single crop per year it had previously produced. Since silkworms feed exclusively on mulberry leaves, production is limited by the available supply of leaves. Once the leaves are used to feed the silkworms in the spring, the next production cycle can only begin when the trees produce more leaves, typically a year later. However, the government began importing “intensive mulberry trees,” which produce leaves in the spring and autumn, from China and first achieved a fall crop of silkworm cocoons in October 2013.
International and Uzbek law explicitly prohibit forced labour and specifically prohibit a government from forcing a person to work against his or her will under threat of punishment or penalty. Yet according to official statistics, the government imposes contracts on more than 45,000 farms per year to deliver annual quotas of silkworm cocoons. Although some of the farms are specialized silk farms, the vast majority are small-scale farms that also produce cotton, wheat, livestock, or vegetables. Given the short but intensive production cycle of silk cocoons, to meet their silkworm cocoon quotas many farmers rely on family members’ labour, others offer in-kind goods in exchange for their neighbours’ labour, and some hire workers, either with written or verbal contracts. In addition to the official number of farms that produce silk, local authorities also require numerous public organisations such as mahalla committees, schools and hospitals to produce cocoons. Where the regional or district hokim also imposes silk cocoon quotas on public organisations, this occurs completely informally and without a contract. The government exploits the vulnerability of farmers and public sector employees to force them to produce cocoons and the system relies on rural poverty since many rural people agree to help farmers produce cocoons in return for in-kind payments of basic items needed for survival, such as firewood and cooking oil. The government owns all agricultural land and farmers lease it with few protections. Agriculture, and especially the production of key or strategic crops such as cotton and silk, is centrally-controlled. The government imposes quotas on producers for cotton, wheat, and silk, and producers must sell to the state at the official procurement price. The government wields tremendous power over farmers: it can take a farmer’s land or assign him less desirable land; government-owned or controlled monopolies supply all agricultural inputs; and the government controls all financial transactions related to farming. The government prohibits farmers from growing vegetable gardens on leased agricultural land, although such gardens provide a crucial means for farmers to feed their families and earn cash. The gardens put farmers in violation of their lease agreements, giving hokims additional leverage over farmers. Public sector employees such as teachers, school officials, and medical workers, and other people dependent on the government for livelihood support such as people receiving welfare payments, are also vulnerable to state-orchestrated forced labour because they fear losing their jobs or social benefits. Most silk in Uzbekistan is produced by from cocoons of the bombyx mori silkworm, and their cultivation, which occurs throughout the country, is a laborious process lasting 30-40 days and carried out entirely by hand. Although the cultivation period is relatively short, it requires significant commitment of time and resources. According to one farmer in the Shakhrisabz district of Kashkadarya, “To get good cocoons you have to put all your other business to the side and work only on the cocoons.” Government-run breeding factories produce silkworm larvae which officials distribute to farmers in mid-April or early May, depending on the climate in each region and when mulberry trees have produced leaves. Silkworms feed exclusively on mulberry leaves and the cocoon-growing season begins as soon as the mulberry trees have leaves. Whereas other silk-producing countries such as South Korea and Japan cultivate mulberry shrubs with leaves that can be machine harvested for silk production, Uzbekistan relies on traditional mulberry tree leaves, which must be collected manually. Upon maturity, the silkworms produce an adhesive substance in their mouths that turns into a silk thread, which they use to construct their cocoons. Farmers deliver raw or live cocoons to collection centres. Later, the cocoons are hand dipped into hot water to clean them and release the silk thread, which is unwound in special silk-winding factories. A single silkworm cocoon produced in Uzbekistan weighs between 1-1.2 grams. One box of larvae, on average, results in 50-60 kilograms of cocoons. The district Pilla branches enter into contracts with farmers for silk cocoon production even though there is no legal basis that requires farmers to produce cocoons. A governmental decree requires district Pilla branches to sign contracts with farmers for cocoon production by February 1 and pay advances to farmers by April 1. The law specifies that advance payments to farmers should equal at least 30% of the anticipated total value of the raw cocoons expected from the farmers based on the quota imposed on each and the number of boxes of silkworm larvae each receives, and that the value be calculated on a futures basis. The law also provides that contracts should be paid in full for the silk delivered no later than November 1 and even provides for penalties for late payments to farmers. In addition, many of the farmers we interviewed said that they received advance amounts of less than 30% of the estimated value, and some received as little as 15%. Numerous farmers reported that they received no payment at all for delivery of cocoons after the original advance. While the Pilla branches manage the contracts, the local hokimiat assigns cocoon production quotas to farmers in its district, and generally link quotas to the size of the farmer’s land holdings even though the requirements of silk cocoon production are unrelated to a farm’s other products such as cotton, grain, vegetables, or livestock. A farmer in Shahrisabz in the Kashkadarya region told us that officials generally distribute one box of cocoons for every 3-5 hectares of land, and this was generally consistent with accounts both from officials and other farmers we interviewed. In distributing the quota for the silkworm cocoons the local hokim’s office does not consider whether the farmer has the necessary experience or capacity, including space, mulberry trees, financial means and workforce, to cultivate the allocated quota of silkworm cocoons. A source in Jizzakh described a meeting with the regional hokim at which the hokim imposed cocoon quotas on farms, schools, and hospitals. The meeting occurred in June, after the usual cocoon cultivation period, underscoring the reality that many farms and other institutions are forced to buy cocoons at inflated prices from other producers or make a bribe payment in lieu of delivering cocoons. We found that although some farmers were aware that the contracting process and imposition of quotas constituted a violation of their rights, they did not believe they could effectively challenge the contract conditions or refuse to produce silk. Stop using the forced labour of Uzbek farmers and personnel of the public organisations in the silk industry. Ensuring financial transparency in all aspects of silk cocoon production. Ratify and apply ILO Convention No. 87 on the freedom of association. Establish a joint working group, including the International Labour Organisation and foreign direct investors, to coordinate strategies on the silk industry in Uzbekistan.